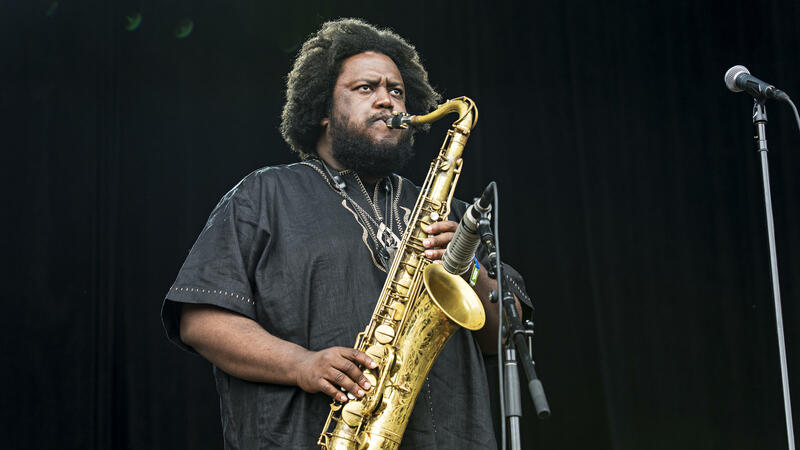 Kamasi Washington, a 37-year-old saxophone player from Los Angeles, is a major player in Nate Chinen's new book Playing Changes. Chinen's new book Playing Changes: Jazz for the New Century opens with a spotlight on Los Angeles saxophonist Kamasi Washington. At 37, Washington's collaborations range from jazz greats like Herbie Hancock to rappers like Kendrick Lamar. "His emergence is just utterly remarkable," Chinen says. "He has this intense physicality as a performer. His music strives for transcendence and I think, often communicates that." And while artists like Washington are making jazz cool in the new millennium, Chinen's aim with Playing Changes is to get the root of the resurgence. "This is a perennial question — this idea of a savior or a messiah figure in jazz," Chinen explains. "I wanted to get to the heart of that question: 'Why do we need someone like that?' What it comes down to I think is a baseline insecurity about the art form's foothold in larger culture." Whereas jazz artists used to have to fight to be taken seriously, the perception of jazz in this century has almost calcified to a point where it's seen as a genre that should be respected but not enjoyed. In Chinen's opinion, the image of jazz has become "too good." "Jazz used to be disreputable. It used to grasp and scramble for respect for cultural esteem. And we no longer have that problem," he says. And although that's a good thing, Chinen argues that esteem comes with a certain cost. "When the push for esteem comes with such a strong veneration for history and for a canon of recordings. Then you begin to see the music at large as a kind of museum piece," he says. Like Kamasi Washington, trumpeter Wynton Marsalis was greeted as a savior when he arrived on the national scene in the 1980s. Marsalis led a Renaissance that raised public appreciation for jazz through a return to its traditional values. Chinen says that became polarizing when Marsalis became the head of New York's Jazz at Lincoln Center. This drew a clear divide between what Chinen calls "the traditionalist wing and the experimental wing" of jazz musicians in New York City. This divide was literal just as much as it was figurative. "Jazz at Lincoln Center and the mainstream jazz clubs were uptown and The Knitting Factory and places like Tonic were downtown," Chinen says. "There was a kind of sorting into camps." But luckily, this rigid division has been relaxed in the last 20 years. Chinen uses Playing Changes to give attention to particular artists who represent something about where jazz is in this moment. Jazz pianist Vijay Iyer is an example of an artist whose work is based on experimentation. "Vijay is to me a really important figure because he comes out of an avant garde tradition," Chinen says. "He's second generation Indian American. But really he is able to appeal to a really broad base of listeners. He's become sort of a consensus figure for the Jazz establishment." And Chinen calls vocalist Cécile McLorin Salvant the "greatest new arrival on the jazz vocal scene." "If she had come up in the 90s, her interest in the past would have led a lot of people to kind of slot her in this idea and it would have become a kind of trap," Chinen says. That means jazz's next great hero could be a heroine. The history of jazz in the 20th century is pretty well-documented, but what about its development in the 21st century? Well, writer Nate Chinen says the music has come a long way since he began covering it in the mid-'90s. He's a former New York Times critic who now works with member station WBGO and also Jazz Night In America. His new book is called "Playing Changes: Jazz For The New Century." And he spoke with our co-host Rachel Martin. RACHEL MARTIN, BYLINE: Your book starts off with a look at this 37-year-old saxophone player from South Central LA named Kamasi Washington. It is 2015, and people are hailing him as some kind of jazz savior. MARTIN: Why'd you want to introduce Kamasi Washington at the beginning of your book? NATE CHINEN, BYLINE: Well, what do they say about stories? You know, one of the stories is that a hero comes to town. CHINEN: His emergence is just utterly remarkable. He has this, like, intense physicality as a performer. His music strives for transcendence and I think, you know, often communicates that. CHINEN: This is a perennial question, this idea of a savior or a messiah figure in jazz, so I wanted to get to the heart of that question. Why do we need someone like that? CHINEN: And, you know, what it comes down to, I think, is a base line insecurity about the art form's foothold in, you know, larger culture - you know, this idea that the music is just completely marginalized. MARTIN: Kamasi Washington himself has weighed in on this. We've got a clip of him discussing it on PBS. Let's listen to this. KAMASI WASHINGTON: I think jazz has been trapped in a poor image, and I think that it's been trapped in this image of something that is a historic relic or something that is to serve some other purpose other than to just enjoy. MARTIN: Do you agree with him that that is the struggle? CHINEN: I think that's been a real problem. And I include that clip in the book to illustrate that there's a funny thing about saying that jazz is trapped in a poor image because what Kamasi's really implying there is actually kind of the inverse. The image is too good. CHINEN: Jazz used to be disreputable. It used to grasp and scramble for respect. And we no longer have that problem. MARTIN: Isn't that a good thing? CHINEN: That's a good thing, but it can come at a certain cost. When the push for esteem comes with such a strong veneration for history and for a canon of recordings, then you begin to see the music at large as a kind of museum piece. MARTIN: The music you're hearing now is by trumpeter Wynton Marsalis. He, too, was greeted as a savior when he arrived on the national scene in the 1980s. As a musician and spokesman for the music, Marsalis led a renaissance that raised public appreciation for jazz through a return to its traditional values. Chinen says that became polarizing when Marsalis became the head of New York's Jazz at Lincoln Center. CHINEN: There was a really clear division between what you might call the traditionalist wing and the experimental wing. In New York City, it was sort of framed in geographical terms. You know, Jazz at Lincoln Center and the mainstream jazz clubs were uptown, and the Knitting Factory and places like Tonic were downtown. MARTIN: Not just metaphorically - literally uptown and downtown. CHINEN: Literally. Yeah, yes. So, you know, 14th Street was sort of a dividing line. There really was this division, and it was enforced not only by the jazz media but by musicians and listeners, and there was a kind of sorting into camps. MARTIN: Why? Because the other side didn't want you? CHINEN: You know, so much of the rhetoric around Wynton's project had to do with definitions and saying, well, this is what constitutes jazz. When you draw that line, there's an exclusion. And so there were other musicians who were experimenting and taking a much less purist approach, and they felt like, well, who needs your definitions? I don't want to be a part of your club anyway, you know? One of the happiest outcomes of what has happened with the music in the last 20 years is that those divisions really no longer make sense, and most younger musicians don't feel the need to choose one side or the other. MARTIN: So the jazz wars are over. CHINEN: The jazz wars are happily over. MARTIN: There's been a detente (laughter). MARTIN: You use the book to give some attention to particular artists who you say represent something about where jazz is in this moment. This is 46-year-old Vijay Iyer, and he's playing a cover of a rap song by M.I.A. This is called "Galang." CHINEN: Vijay is someone who comes out of experimental protocols and traditions, but he translates that into something that's really appealing. MARTIN: All right. Let's close it all out with Cecile McLorin Salvant. She's 28 years old. Let's listen to a little bit. CECILE MCLORIN SALVANT: (Singing) Oh, how the time seems to stop with your face in my hands, with such trickery. See how it's flying away. And there's nothing I can do. MARTIN: She's got an awesome voice. CHINEN: I think she's the greatest new arrival on the jazz vocal scene. She's also fascinating to me because if she had come up in the '90s, her interest in the past would have led a lot of people to kind of slot her in this idea, and it would've become a kind of trap. And Cecile is having none of that. And we aren't really expecting it from her. You know, that's how the culture has changed. Her interest in the past is so deep and so genuine, but she's not re-inhabiting something. She's actually sort of interrogating it. And she really helps us to sort of see it anew. MARTIN: So the hero that you're looking for could be a heroine. CHINEN: That is absolutely true. MARTIN: (Laughter) Nate Chinen's new book is called "Playing Changes." Nate, thanks so much for talking with us. CHINEN: Thank you. This was fun. SALVANT: (Singing) I lived a dream with you. Transcript provided by NPR, Copyright NPR.